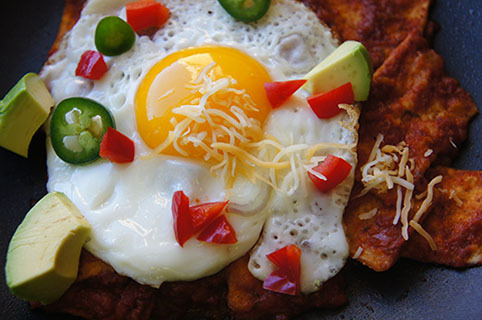 Chilaquilles is a popular Mexican breakfast or brunch dish that is widely enjoyed in Texas and California. It is a great way to use up some day old corn tortilla chips because the chips are simmered in sauce, in this case Larry’s All Natural Chipotle Taco & Enchilada Sauce, and then topped with a fried egg and cheese. I always order chilaquilles when I am in Austin. One of my favorites. Pour Larry's Chipotle Sauce into a two to three quart saucepan and heat over medium until the sauce is just lightly bubbling. Add the corn tortilla chips, lower the heat to medium low, cover and simmer for five minutes or until the chips are just beginning to soften but still have some crunch. Fry one or two eggs per person to sunny side up or over easy. Poached is good, too. Spoon equal portions of the chips/sauce mixture onto individual plates, top with the fried eggs, Sprinkle the cheese on top of that and adorn with avocado, red pepper and jalapeno.